The sense of sight is indeed a blessing. But, we tend to neglect this gift and subject our eyes to a lot of stress and strain every day. We end up working every day for a good 8-9 hours in front of computer/laptop screens, only to return home and start playing games on our cell phones. And then, there are the social media updates that have become part and parcel of most of our lives. Computer vision syndrome is a result of all such digital exposure that we put our eyes through. Globally, computer vision syndrome affects about 60 million people (1). If we continue straining our eyes without taking the basic precautions, it may inevitably lead to further eye complications. To know how to care for your eyes while using your computer and more, read on! Computer vision syndrome is a term used to describe all eye or vision problems that occur as a result of prolonged computer use (2). It is also commonly referred to as digital eye strain. Researchers are of the opinion that around 50%-90% of individuals who work at a computer screen exhibit at least a few symptoms. However, it is not only the working adults who are affected. Children who stare at tabs or computers for too long can also develop issues, especially if the lighting and their posture are far from ideal. You might be wondering how computers can affect your vision. Find out in the next section. Computer vision syndrome (CVS) is kind of similar to carpal tunnel syndrome as well as other motion (repetitive) injuries you are likely to get at work. It is caused by the repetitive movement of your eyes in the same path for long durations. When you are constantly looking at the computer, your eyes have to focus and refocus constantly – time and again. They keep moving back and forth from the computer to other things you may have to read or write down in between. They also react to the changing images on the computer screens. While such jobs may look easy, they require a lot of effort from your eye muscles. Let’s now take a look at the causes. Those suffering from this syndrome exhibit the signs and symptoms listed below. So, are there any tests that can help the doctor diagnose this condition? The opthalmologist can help diagnose your condition by carrying out an eye examination. Special attention might be given to how your eyes work and respond to different distances from the computer screen. Your doctor may also question you about your symptoms and how much time you spend in front of the computer screen to confirm the diagnosis. Once diagnosed, you may be asked to make a few simple changes to your working style. The following are some of the widely accepted practices for treating CVS. Once you are diagnosed with computer vision syndrome, it is very important that you visit your ophthalmologist for regular check-ups to prevent your eyesight from deteriorating further. Medical prescriptions may include glasses or contact lenses as per your requirement. You may be given a regular pair of glasses to wear while looking at the screen, or you may be asked to get a special pair. Single, bifocal lenses, or tinted lenses may also be prescribed to boost contrast while filtering out the glare. Change any lighting that could be casting a glare on your computer screen. You can also reposition your computer if the light from a nearby window is the cause. Install a dimmer switch on the overhead fixtures that could be casting a glare on your screen. Rearrange your desk to slightly below your eye level and 20-28 inches away from your face. Give your eyes a break by looking at least 20 feet away every 20 minutes for 20 seconds. This is called the 20-20-20 rule. Tweak the font size and brightness of your computer so that you don’t have to strain your eyes much. All these simple changes can work wonders for your eyesight in the long run. 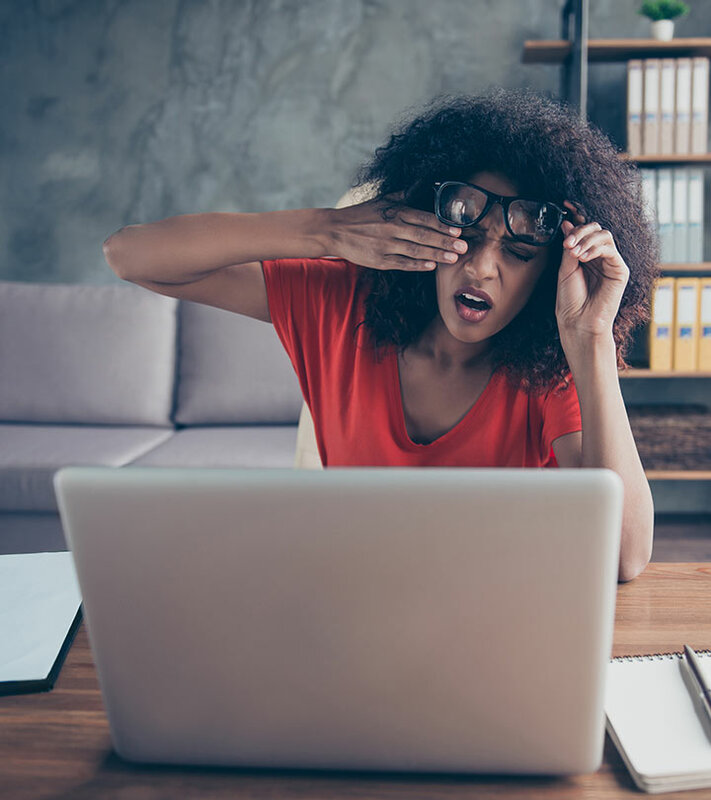 Here are some additional tips to prevent digital eye strain or CVS from recurring. 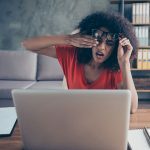 While you don’t have to cut down on your screen time completely to prevent computer vision syndrome from resurfacing, a few changes to how you use them can make things easier on your eyes. Use an anti-glare screen filter or a matte screen filter on your computer, phone, as well as tablet screens. Take a break, for, say, about 15 minutes, after every 2 hours of using the screen continuously. If your eyes tend to feel dry often, use artificial tears to lubricate them. Place a humidifier in the room, close to the screens, to prevent your eyes from drying. Make sure the lighting of your surroundings is bright enough for your screens. If you are a contact lens user, wear your glasses and give your lens a break while using the computer screen. Get your eyes checked by an eye care specialist regularly. Follow a healthy diet that is rich in various vitamins and minerals. Practice eye exercises like blinking slowly, rotating your eyes in the clockwise direction, or simply looking far away for a few seconds every now and then. The way you sit in front of your screen and the distance at which you sit from it also play a significant role when it comes to treating computer vision syndrome (4). Sit close to the keyboard and position it right in front of your body. Adjust your keyboard level in such a way that your shoulders are relaxed, and your wrists and hands are parallel to the keyboard. Sit at an arm’s length from the computer screen. Position the screen slightly below your eye level. The center of the screen should at least be 10-15 degrees below your eye level. Take small breaks every 1-2 hours. Do not use the digital screens during your break. It is very easy to neglect the misery you put your eyes through in your busy day-to-day life. However, a little care and a few tweaks to your lifestyle can go a long way in promoting healthy eyes. Do you have any more queries regarding this syndrome? Don’t hesitate to ask us in the comments box below. How long does it take for computer vision syndrome to go away? Computer vision syndrome is a temporary condition that may last from a few minutes to a few days. If left unattended, it can cause further damage to your eyes. Is computer vision syndrome permanent? Computer vision syndrome does not have any long-term effects and is usually a temporary condition. How can I relax my eyes from stress? To relax your eyes from constant stress, blink them every 20 minutes and look far away. You can also try placing the base of your palms on your eyes for a few seconds. 1. 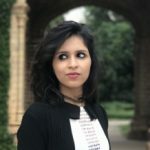 “Computer vision syndrome among computer office workers in a developing country: an evaluation of prevalence and risk factors” BMC Research Notes, US National Library of Medicine. 2. “Computer vision syndrome: A review.” Work, US National Library of Medicine. 3. “Computer vision syndrome: a review.” Survey of Ophthalmology, US National Library of Medicine. 4. “Understanding and Preventing Computer Vision Syndrome” Malaysian Family Physician, US National Library of Medicine.